Passing through the backwoods town of Sparta, Mississippi, Philadelphia detective Virgil Tibbs (Sidney Poitier) becomes embroiled in a murder case. He forms an uneasy alliance with the bigoted police chief (Rod Steiger), who faces mounting pressure from Sparta's hostile citizens to catch the killer and run the African American interloper out of town. Director Norman Jewison splices incisive social commentary into this thrilling police procedural with the help of Haskell Wexler's vivid cinematography, Quincy Jones's eclectic score, and two indelible lead performances—a career-defining display of seething indignation and moral authority from Poitier and an Oscar-winning master class in Method acting from Steiger. 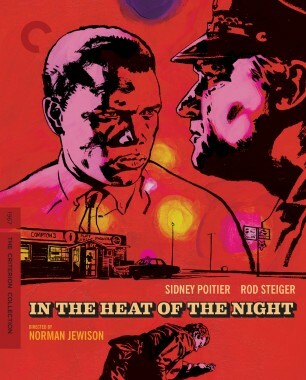 Winner of five Academy Awards, including for best picture, In the Heat of the Night is one of the most courageous Hollywood films of the civil rights era. I seem to recall that there is some sort of issue with the existing MGM Blu-ray, at least in some shots? From looking at reviews it seems that it could be in a situation like The Great Escape, where the last restoration work was done ages ago in analogue as opposed to digital. I'll admit I don't remember watching my copy, but hopefully, this will be a good upgrade. I'm very pleased they got an interview from Jewison (at 92! ), but it's a little perplexing that they couldn't get something from Poitier (at "just" 91) given that he was in attendance and did a Q&A for a 50th anniversary screening last year. I hope he's still doing okay. Magic moment: seeing this on TCM in my early teens was one of my first revelations that old films could be great. Haven't seen it since then, and hadn't thought about it for a long time but did today at work for some reason, and then I come home to see it announced! Looking forward to revisiting. This is one I haven't seen, but I remember bits and piece of the television show, especially when they'd rerun it on TNT and WGN. I seem to remember not too long ago Showtime was developing a modern-day version of the material for a series but nothing ever came of it.